A crossover from singing to acting is becoming a trend in the local show business that people would think it is that easy. Actually, only a few has done it so successfully. But what is a career without taking the risk. For a young talent and a fresh face like Bryan Termulo, he wants to be one of those who dared and only in a span of few years, it is slowly paying off. 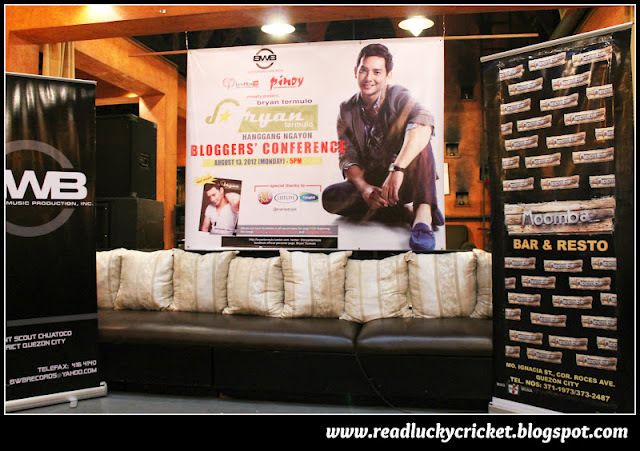 Beaming, hopeful and full of energy, Bryan performed four songs and gleefully answered questions from the press during the bloggers conference he held to promote his sophomore album "Hanggang Ngayon" at Moomba Bar in Quezon City last August 13. Aside from his second album, he was also excited about the developments of his acting career. After a stint at GMA's soap "All My Life" and a few episode of ABS-CBN's "Wansapanataym" and "Budoy", he is bound to join a powerhouse cast which includes Judy Ann Santos in the drama series "Against All Odds". "Super excited ako to not only sing the theme songs sa teleserye kundi maging part na 'rin ng mga teleserye. I am thankful that they recognized my talent in acting too", Bryan said. "Of course, best example natin si Miss Sarah Geronimo who excelled in both singing and acting", the young balladeer added. In "Against All Odds", Bryan will be throwing speaking lines with the most formidable actors in the industry like Mylene Dizon, John Estrada, Tirso Cruz III and Coney Reyes and will share some scenes with the stars of his generation including Jessie Mendiola, Joseph Marco, Sam Milby and KC Concepcion. But if asked which he loved the most from the 2 crafts, Bryan smiled with assurance: "Ang dali naman pong sagutin ng tanong niyo. Syempre, first love ko singing, so mas malapit dun ang puso ko". 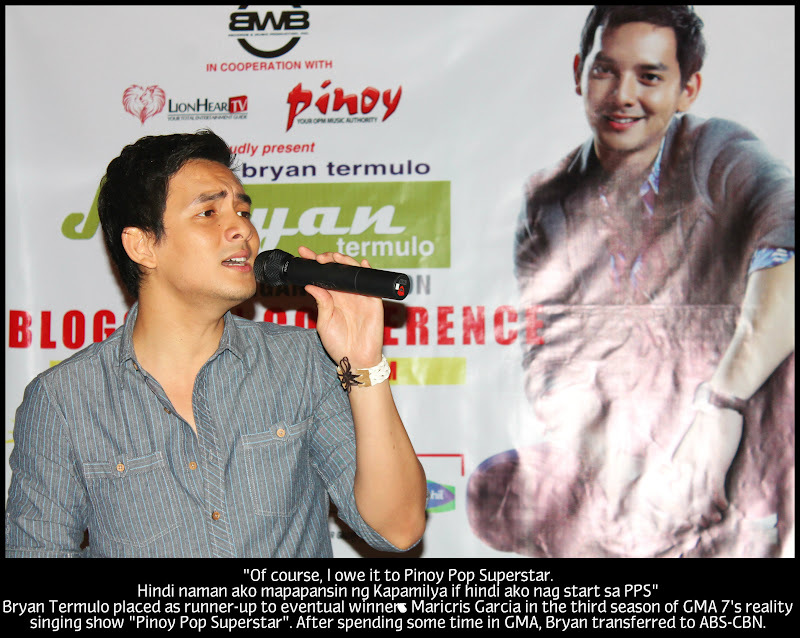 His first album which carries teleserye songs "Bihag" and "Paano Nangyari", both used in the drama soap "100 Days To Heaven", earned him the recognition as the "New Prince of Teleserye Theme Songs". 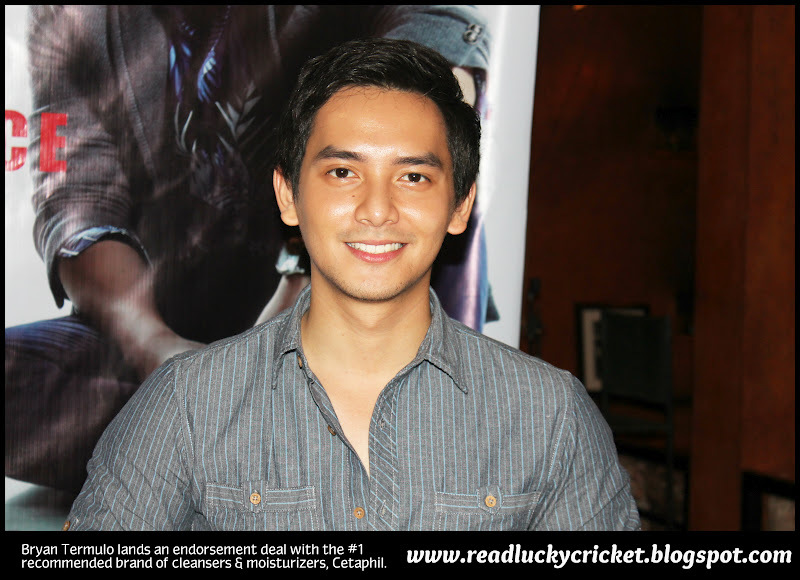 His version of "Dadalhin" is also used in the current drama series "Walang Hanggan". His strong presence in the airwaves also got him nominated as "Best New Male Recording Artist" by the Philippine Movie Press Clubs' (PMPC) 2012 Star Awards for Music and brought him to represent the Philippines in the World Championships of Performing Arts (WCOPA) where he won 2 silver medals and 1 bronze. No cutting the momentum, Bryan releases right away his second album "Hanggang Ngayon", following the title of one of the most listened-to songs in the radio these past few months. 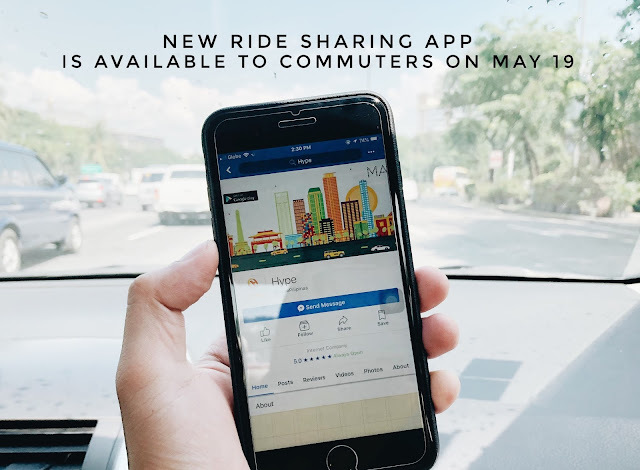 "Ito na po. May second album nako! 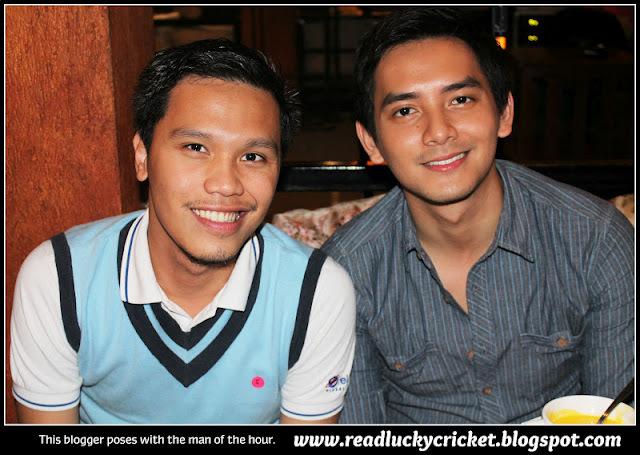 ", Bryan said while greeting the bloggers who attended the event. During his bloggers conference, Bryan sang some of the tracks in his album, "Lagay ng Puso", "Nasaan Ka Na", "Hanggang Ngayon" and also performed his Platinum single "Dadalhin". To swoon over the most romantic out there and to set himself apart from the rest of the country's top balladeers, Bryan explained that the all-Tagalog repertoire in his album is what will make it unique. "'Yung mga kanta ay para sa mga broken hearted. Talagang I made it all very emotional", he explained. From which he immediately clarified, "...pero di naman po ako broken hearted. OK naman po ang heart ko!". His fans can also catch him regularly at the ABS-CBN's Sunday Variety Show performing with ASAP Boys Are Boys co-members JM de Guzman, Marrki Stroem, and Alex Castro. Bryan Termulo's second album is already out in major record stores, nationwide!